A new contemporary family home that takes advantage of a sloping site to create dramatic views through the angophoras and to create a generous landscaped garden around three sides. Extensive use of stone to walls and floors also extends to the exterior, linking the interior to the garden. 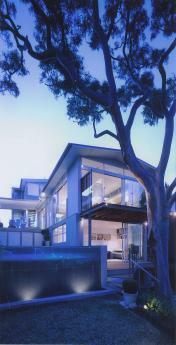 The glass wet edge to the pool allows views through the water into the garden and beyond. North facing roof windows allow winter sun into the living areas over the top of an adjoining building, creating a light filled interior year round.